This summer 11 miles of Highway 1 was cut off to the rest of the world and only accessible via the long, windy route of Nacimiento Fergusson Rd. that takes us through the Fort Hunter Liggett military base. Either end of this section of highway was cut off after storms brought long needed rains following a drought and terrible wildfires in Big Sur. The Pfeiffer bridge to the north was demolished by Cal Trans after deeming it unsafe due to age and storm damage. 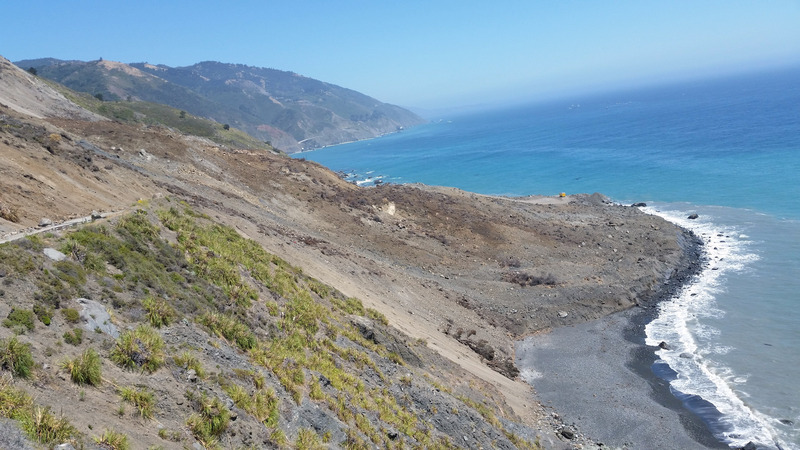 The massive Mud Creek Slide between Gorda and Ragged Point made the highway in between those 12 miles inaccessible. In latter May of 2017 the Mud Creek Slide along the Big Sur coastline became the largest in known California history. The slide has changed the shape of the coastline, looking like the mountain is sticking out a big toe into the ocean. The new toe of landfill is reported to be 16 acres. The slide has closed Hwy 1 between Ragged Point and Gorda for at least a *year. We had the privilege of walking down the middle of the closed off highway beginning in Gorda at the road closure gate when construction crews were not at work. It is a short hike to where the 2 lane highway has been literally wiped off the mountain side with a view of the new toe of coastline. As we walked we saw water seeping out of the mountain, running alongside the road and actually seeping up out of the asphalt! The mountain was not yet finished moving, further hampering repairs. Several trips over the Nacimiento Fergusson Rd to reach this newly isolated stretch of Hwy 1 along the Big Sur coastline afforded us some great camping. Recent rains had caused a slide on this narrow, twisting route, but the county repaired it so that you can drive it as a single lane, giving right of way where needed. Watch for fallen trees and rock slides which are common on this roadway. One day as we drove towards the coast we met several AT&T utility trucks coming up the mountain along Nacimiento Fergusson road and wondered why. In Gorda we discovered the mudslide had taken out all the com lines to the little hamlet. 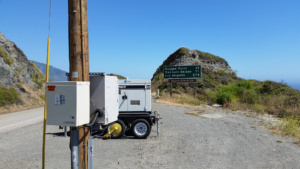 Work crews came and installed a pole with a dish and generator pointed directly across the slide towards Ragged Point to a receiving station to get a signal for phone service. The businesses at Gorda were grateful to once again be able to accept credit cards and have communication there, as there also is no cell service in the town proper. Locals know that at a nearby turnout, a cell signal can be found to make calls. My Verizon service works in this tiny spot. Construction trucks stop in this scenic turnout to phone home. However, along the back country ridge route in the middle of nowhere we discovered very good cell service! During this unique time we camped along this amazing stretch of highway to the sound of the roaring ocean below the wildflower covered cliffs. Sadly camping in turnouts is no longer allowed directly along Hwy 1 where years past we enjoyed a quiet get away only an hour or so from home. It seems the government is working to make folks camp in crowded, designated areas only. There are several developed State campgrounds along Hwy 1, but this is not our style of camping to enjoy peace and quiet. However, there are lots of camping options along the Plaskett Ridge route by dirt back country roads with breathtaking views of both the ocean and vast mountain inland valleys. From U.S Hwy 101 take the Jolon Rd. exit towards Ft. Hunter Liggett . Drive through the military base entrance kiosk and follow the road signs to Nacimiento Ferugusson Rd. Be prepared to have your driver’s license and proof of auto insurance ready if the kiosk is manned during a heightened military alert. You can reach the ridge route from the north via Nacimiento Fergusson at the Vincent Peak / Alms and Prewitt Ridge intersection. Turn south towards Prewitt and look for turn outs off the road to camp. The Alms Ridge area has a maintained primitive camping area with 3 rough sites with no toilet. There are many primitive camping sites along the main ridge route. From the southern end of Highway 1 near Gorda turn at the Tree Bones sign and keep to the left to follow the steep, windy route to drive along the spine of the mountain with sweeping views on both sides of you; the Pacific Ocean to the west and that vast mountainous valleys to the east. In the spring and early summer the wildflowers are vibrant. We discovered trails to small waterfalls and an old mercury mine where the water runs a lethal red color. In June, the Monarch butterflies were like a fluttering snow flurry feasting on their favorite venue of milkweed. Rain can make the ridge route impassable so keep your eye on the weather. *Caltrans has plans to span the Mud Creek Slide by various means to reopen the Highway in 1 year. Watch a video about this engineering feat in the San Luis Obispo Tribune.